Another day, another Colorado 14er. Uncompahgre is an impressive-looking peak from all directions and is the highest summit in the San Juan Mtns of Southwest Colorado. It's also a fairly easy one, with a trail going all the way to the summit, about 3.5mi one-way and less than 3,000ft of gain. This was a perfect summit to save for Eric, provided we could drive to the 4WD TH at 11,400ft. The 2WD TH was more than 2,000ft lower and 4mi down the road, a non-starter in Eric's assessment. Luckily, we'd gotten the jeep repaired the previous afternoon in Lake City and were able to drive it up the rough road the previous evening. We camped there for the night and were up around 5a for a 5:45a start. It was just light enough that we didn't need headlamps. The weather was overcast with clouds left over from the previous evening's storms. These would dog us for most of the day, though there was only a few sprinkles and the temps were nice and cool for hiking. Per usual, this 14er trail was as busy as one might expect, perhaps a dozen parties sharing it with us today. It's very picturesque, meandering at a gentle grade up through a very green basin along Nellie Creek. Uncompahgre can be seen soon after starting out, staying in view for the remaining distance. We caught up with a woman who'd started up from the 2WD TH (it took her 2hrs to climb to the 4WD TH) and the three of us traveled together the remaining distance to the summit. She recognized us from the previous day on Redcloud/Sunshine and we spent much time in pleasant conversation. Though the peak has some imposing cliffs surrounding the upper 600ft of the summit, the trail deftly winds up through it from the south, with only a short, 30 to 40-foot section of class 2-3 scrambling. We'd read numerous TRs describing this section and its various options in extended detail, making much of it. We found it rather tame, and even Eric, who has trouble with exposure and scrambling, didn't find it any real difficulty. Above this, the good trail resumes the remaining distance to the summit. Clouds were sweeping over the top as we summited at 8a. Our views were terribly limited, a shame on a peak whose views have been much lauded, and it was windy and cold to boot. We found no register though we didn't look too hard after having visited the two likely points to the west and east. A few crappy photos, and we were heading back down less than five minutes later. I stayed with Eric until we were below the "crux", having taken the slightly easier left option on the descent after using the other for the way up. I was after a pair of nearby 13ers for bonus credit and extra exercise, so Eric and I parted ways at this point. The first summit was located about 2mi southeast of Uncompahgre along a connecting ridgeline. I followed the trail down to its junction with the Matterhorn Peak Trail, then headed cross-country. There is a stretch of tortured pinnacles on the ridge to the peak, so I dropped 300-400ft down the southwest side of the ridge to avoid the difficulties. I tried to string together the vegetated areas to reduce the amount of talus scrambling, eventually finding my way back up to the ridge for the last 1/3mi of scrambling to the summit, all class 2. I found a register here dating to 1993, quite old for a Colorado summit. The original entry had given the name "Noncompahgre Peak" to it, a fun play on its higher neighbor that I've decided to use here. I took a few photos of the views and headed back down the ridge to the saddle with the difficulties. This time, I dropped down steep grass and loose sand/dirt slopes on the northeast side, a better option, I thought, for climbing Noncompahgre. The second peak was only a mile and half northeast of Noncompahgre, but I made a tactical error by misidentifying the peak on my GPSr and thought it was more like three miles (I'd confused it with another summit much further east). This was going to take some time to reach, I thought, but at least most of the terrain is easy cross-country. 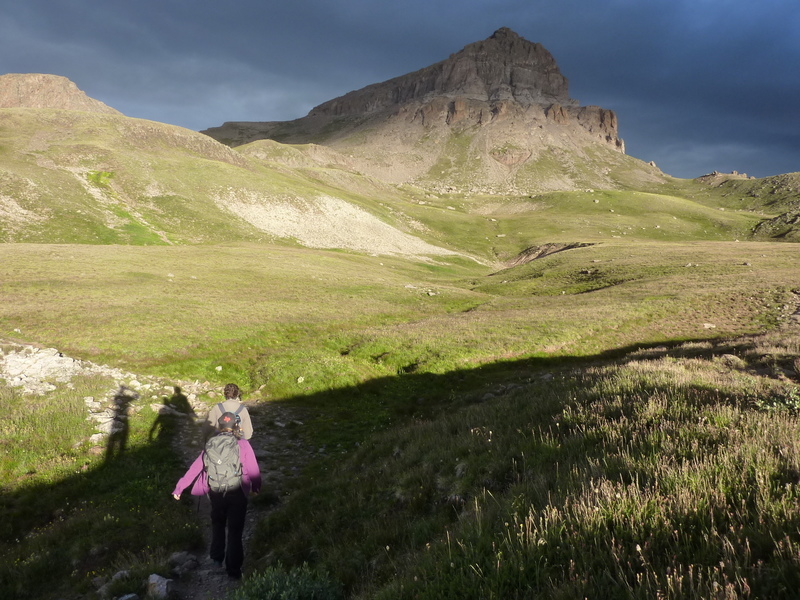 I headed north, not really in the direction of the peak, in order to reach Uncompahgre's long NE Ridge that looked to make for a nice ridge traverse to the second summit above the Nellie Creek drainage. After crossing the Uncompahgre Trail, I spied another climber on the slopes above me, apparently also wandering cross-country. Before reaching the ridgeline, I was surprised to find an old trail traversing below it, what turns out to be an old trail to the summit, still shown on my GPSr. I never did reach the ridge as I'd planned, instead following the trail east towards the other climber. I was surprised to find it was Eric (he'd put on a different hat that I didn't recognize). He'd been watching my progress to and from Noncompahgre and decided to intercept the route he guessed (correctly) that I would take. It was now 10:30a as I relayed to Eric that I still had more than 2.5mi to the second bonus peak. I guessed it would take me until 1p to return to the TH, so Eric had lots of time to kill. We walked together down to a a saddle where an old trail junction is found, and again parted ways. I began climbing the ridgeline above and east of the saddle, eventually stopping at a grassy shelf short of the highpoint to begin traversing around the south side of this intermediate point. There was much sidehilling along this slope, not terribly difficult, thankfully, as I continued heading east at a good pace. As the terrain ahead began to reveal itself, I realized the peak I was heading for was across another drainage from Nellie Creek, quite odd since I had thought it was almost directly above the trailhead. I went back to the GPSr and discovered my error. The intermediate point I was sidehilling around was in fact the peak I had intended and I had gone half a mile past it in my haste. I briefly considered continuing to this other, third bonus, but concluded it would take until 2p to return and there was no certainty that the weather would hold. I changed gears and headed up to the ridge above me, then approached the peak from the east along the ridgeline. There were two points of similar height that held tall cairns. The eastern one had a register calling it "Nellie Point" which seemed as good a name as any. The last visitor had left the plastic jar upside down and exposed, leaving the pages wet and unwritable. Another Colorado register fail. There seems to be more of these than dry, successful ones.